I was watching TV yesterday around 4PM and was feeling very hungry. Thought of making some sweet as one of my friends asked me to post more sweet recipes. Thought of doing carrot halwa, but did not have carrots! The next easy sweet as far as I know is Rava Kesari. This is a recipe mostly done in festivals and also in marriages. For breakfast in most of the south Indian marriages will be Rava kesari, bajji or bonda with coconut chutney and also pongal. Yummy! the thought itself makes me hungry and drool. Indian Food rocks! Rava Kesari also called sooji halwa, is very easy to prepare. All you need is rava (sooji)! In a pan, add butter. Whe it is melted add the nuts and raisins and saute them. Add the sooji(Rava) and saute for few min. When you get the smell of Sooji geting roasted in ghee (wow! it really is a pleasant smell), you add sugar and mix well. Now add water and cook it in medium flame. stir occasionally. Add a pinch of salt to enhance the flavour. After 2 min, check if the sooji is cooked and serve hot! thats a delcious sweet recipe!! !i love rava kesari..congrats on ur well deserved award sangeeth..thank u so much for thinking abt me:)and adding me to ur blogroll..u r very kind...am really happy and grateful. i've eaten this so many times but never knew how to make it...thanks for the recipe! Delicious entry, pics looks mouth-watering, yummm :))) Congratulations on ur well deserve award!!! hey sangeeth, congratulation on ur award & delicious halwa..
Congrats on your award. Love the kesari color :) Everyone fav right? rava kesari looks simply delicious, Sangeeth! I too love the smell when it's cooking. Congrats on the well deserved award. 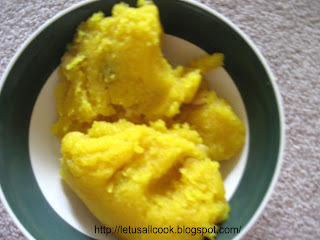 rava kesari looks so yummy..love the colour...BTW, congrats on your award.. This is one of my fav sweet..second only to mysore pav..
Sangeeth, cong on ur award! This kesari looks dellllllllliciooooooouuuuuus! Yum. Where could I find rava? Is it available outside of Indian food markets? chou..you can find rava in any market...just ask for sooji(farina). Hi Sangeeth! I have something for you! Check my blog. This is one of my fav desserts tht is made during festivals. Esp. with raisins and nuts added to it. Why did you stop writing at Mind Manager?